2017 saw gold vinyl versions of ‘Hunky Dory’ and ‘The Rise and Fall of Ziggy Stardust and the Spiders from Mars,’ released 45 years to the day of the first issuing of Ziggy. 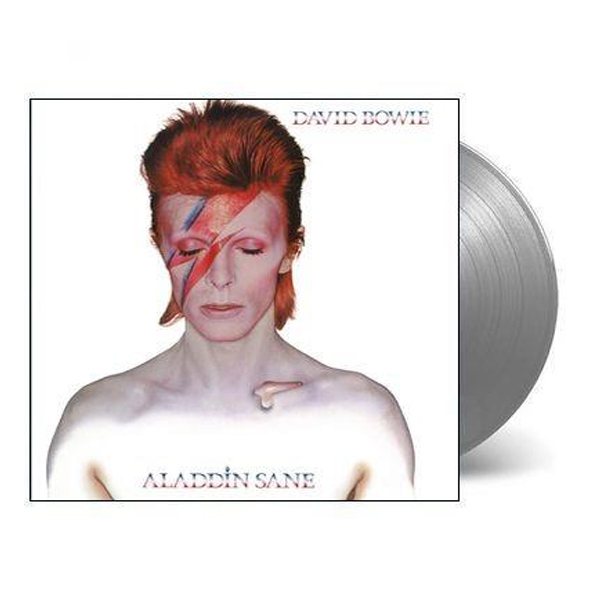 To celebrate the 45th Anniversary of the ALADDIN SANE album; there will be a special limited edition silver vinyl version released. This strictly limited one run only silvery vinyl edition of ALADDIN SANE will contain Ken Scott’s approved 2013 remaster and will be released on 20th April, 2018, 45 years to the day since the original release date for the album. Previously thought to have been issued on 13th April, 1973, new evidence has come to light that proves the release date was officially the 20th, but being Good Friday in the UK the album was 'made available' on the 19th. Recorded in London in late 1972 and early 1973 in New York and Nashville while Bowie and the Spiders were on the Ziggy Stardust Tour and coming on the back of two top ten UK singles, ‘The Jean Genie’ and ‘Drive-In Saturday’. Aladdin Sane was described by David as "Ziggy goes to America".